This is slightly old news, as the Cohesity announcement went up a few weeks ago, but Nick Howell was nice enough to reach out and give me some background on what Cohesity were all about prior to me seeing them at SFD8. Cormac also has a typically enlightening post over here that is worth your time. Note that I’ve not had any stick time with this gear, nor do I have any customer data on how well it performs, but based on the briefing I received I think it’s worth investigating further. People have started to twig that “secondary data” is becoming a problem in enterprises. Secondary data could be your backup and archive data, or it could be snapshots in test / dev environments that are current or stale, or it could be a bunch of data used for analytics. In large organisations, particularly ones with active developers, this can be a drain on storage resources. Understanding where everything is and what it does can also be a problem. This is where Cohesity step in. 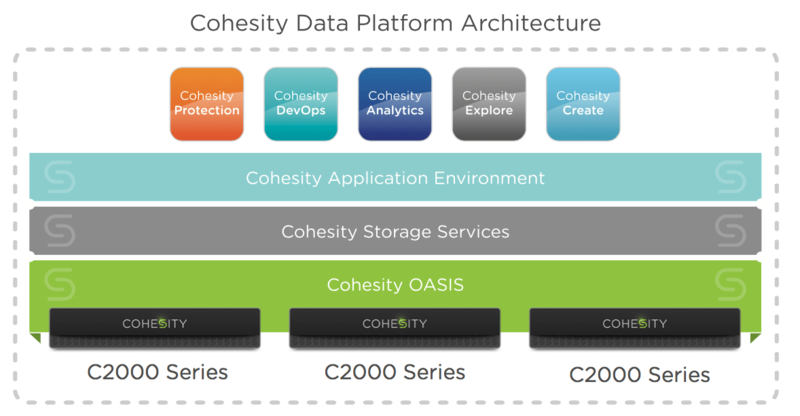 The Cohesity Data Platform is a combination of hardware and software. I have a soft spot for this approach, as I still feel that we’re not quite there with the “oh, you can run it on anything” software-defined storage nirvana that everyone is constantly chirping about. That said, just because you’ve slapped some code on some tin doesn’t mean you’ve automatically fixed the problem. Here’s a look at the Data Platform architecture. I’m going to focus on a bit of the hardware and software in this post, but there’s a really good white paper on the Cohesity site that goes into some depth about how it all ties together. The hardware appliance is an Intel-based 2RU appliance comprised of 4 nodes (4 nodes to a Block). 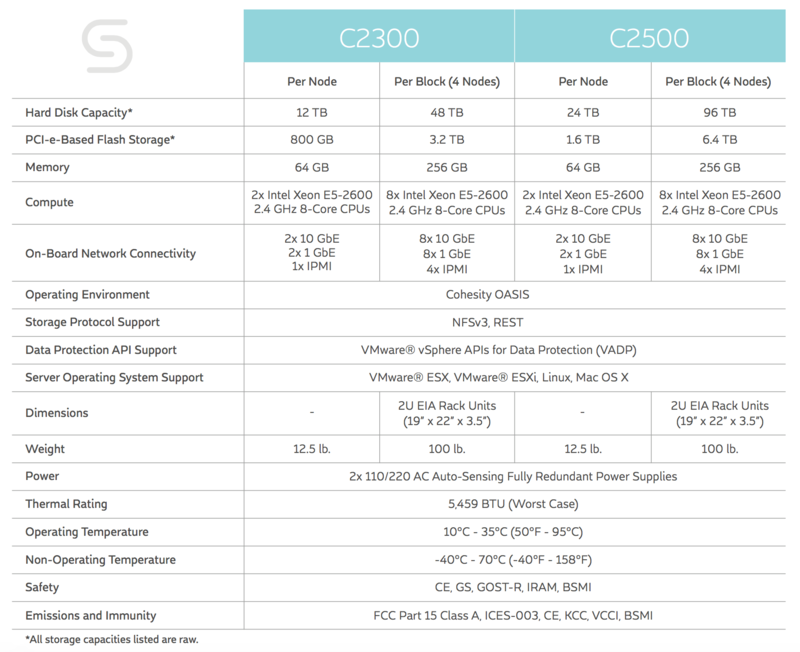 There are 2 versions – the C2300 and the C2500. Ostensibly the difference is in the available capacity of the nodes. Here’s a table that says this more clearly than I have. In-Place Analytics: Cohesity offers built-in and programmable data analytics. 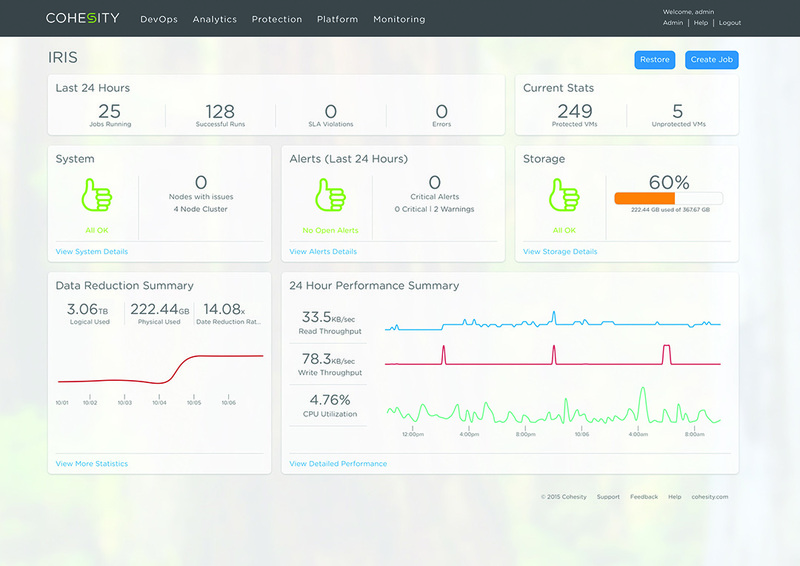 Cohesity’s native analytics capabilities provide real-time metrics and forecasting, while its programmable Analytics Workbench empowers businesses to run custom queries against their datasets. All analytics are run in-place on the Cohesity cluster to maximize time-to-insight and eliminate the need for separate data analytics infrastructure. Support for integrated third-party analytics applications will be available in 2016. The UI looks pretty, and seems easy enough to navigate (although I’ve only seen screenshots at this stage). I like the thumbs up. Deep down that’s all we really want to know from our storage gear. Mohit Aron has some pretty good experience up his sleeve, and I think Cohesity have come up with a solid approach to the problem they’re trying to solve. I’m really looking forward to hearing what Cohesity have to say at Storage Field Day 8, and I’m keen to see how they make some of the things on their roadmap happen in the near future. In the meantime, check out Nick’s announcement post here, and Mohit’s announcement is here.